Click here to view this article published on MOGUL, an online publishing platform for women. Click here to view this article published on KevinMD.com, a health blog for physicians about all things medical. At 12 noon EST, medical students all over the United States simultaneously opened envelopes which revealed the destination of their residency training. The tradition is an exhilarating and emotional event for everyone involved. For medical students, it is a milestone that symbolizes a dramatic life change and a new adventure. It marks the culmination of years of hard work, the end of one thing and the beginning of another. For me, Match Day was an opportunity to reflect upon the difficulty of my medical school years and how those struggles changed my professional and personal life for the better. My medical school years have undoubtedly been the most challenging ones of my entire life. There were long and endless hours of studying, filled with facts and jargon and medications and algorithms. There was self-imposed pressure not only to memorize but also, more importantly, to understand the pathophysiology of disease. There were exhausting days and nights in the hospital. All of that was difficult, but none of that was the hardest part. During medical school, I came to understand the true meaning of responsibility and sadness that all adults – health professional or not – must eventually endure. I am not referring to the responsibility of paying tuition bills on time or the disappointment of not acing Step 1, but I mean the deep commitment and intimate concern we have for those dear to us. Part of this came with the realization as a medical student that one day the entire well-being of a person would be subject to my own medical knowledge and decision-making. Most of it was the actual experience of losing people who I cared for, on both sides of the doctor-patient relationship. I had my first exposure to critical illness, the dying process, and finally death while working on the inpatient wards. I tried to be as objective, rational, and data-driven as a diligent physician-in-training could be, but I was wholly unprepared for the emotional toll that the loss of patients took on me. The first was a gentle, kind lady with whom I bonded despite an enormous language barrier between us. Our medical team made the diagnosis of a rare gynecologic cancer. I studied and learned the expected course of the disease; however, I could not fathom just how close a person could be to death even though we smiled in conversation via the translator phone each day. Just over a week later, she passed away. At first, I was in shock; by evening, I was hidden in a corner of the house staff workroom, alone in tears, mourning a beautiful soul that passed to the other side. Since then, I have participated in the care of a number of patients who, despite the most optimal care and the most valiant efforts, have died. Every single one has impacted me. However, death burdened not only my academic life but also my personal life. At the beginning of medical school, I lost my uncle, whose son was also a medical student, to lung cancer. Soon after I lost my aunt to hemorrhagic stroke. My world came to a screeching halt when my own mom, my unconditional supporter, my strongest rock, and my greatest inspiration, passed away from colon cancer. I took a leave of absence so that I could share more precious moments with her in her last months. During that extra year, I also lost my dear friend, a young, charismatic person taken too soon by amyloidosis only seven weeks after we celebrated her wedding. I thought the heartache was over – at least for these five years of school – when our beloved family dog passed away unexpectedly just five days before Match Day. Other doctors and student doctors are not immune to heartbreak. While in medical school, I have witnessed and shared in their grief of losing patients and loved ones. My husband lost his uncle, whose daughter was also a medical student. My best friend lost her dad. We were studying for a cardiology exam at his bedside when it happened. Another friend also lost her dad only last week. 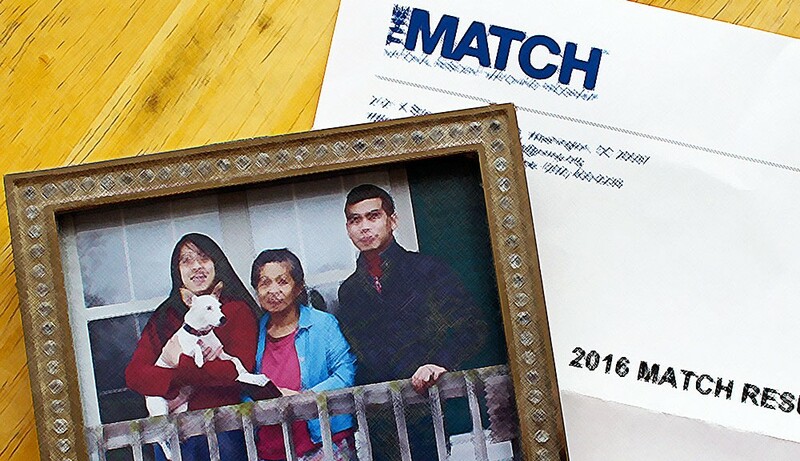 His spirit watched over her proudly at Match Day, as she opened her envelope and learned that she had successfully matched into residency. More than anything I’ve read in a textbook or heard during rounds, it is the intense personal losses during medical school that have contributed to my truly comprehending and absorbing the profound privilege it is to care for a panel of patients, each of whom is the center of someone’s life, just as my mom was the absolute center of mine and my friends’ fathers were the centers of theirs. In our personal lives, we medical professionals have focused our energy on caring for our own loved ones. Now in our careers, we care for an entire panel of someone else’s loved ones on a daily basis. Whether the situation is dire or not, we see our loved ones in the faces of our patients; we see ourselves in the faces of our patients’ families. Sorrow is an inevitable part of life. My medical school years have shown me that death is not something I can escape in my profession and that I as an earthly doctor cannot fix every problem. Instead I can only strive to be a physician who cures sometimes, treats often, and comfort always. I can only hope to make an impact on every patient, whether that is improvement of symptoms, stability of health, or even peace in death. At Match Day, I could see the end of my medical school years approaching and the next step of residency coming into focus. At my side was my husband; in my hands was a photograph of what was dearest to me – my mom, my brother, our dogs, our home. I looked at this two-dimensional representation of the blessings in my life, and my heart ached as I thought about how difficult medical school has been and how much has changed since I and others have lost loved ones. At the same time, I was comforted as I reflected upon their impact on me and many others, a legacy that extends far beyond their living and breathing and being on earth. The lives they lived inspire my life, my actions, and my work; caring for them at the end of their journeys shaped my growth as a person and as a doctor. I closed my eyes and dedicated my career to serving others in their memory. Then I opened my envelope, ready for the years that lie ahead. A very touching and inspiring real life story.